International departure taxes of $122 plus current fuel surcharges of $320 are included (subject to change). Today our pilgrimage begins! We depart Indianapolis via best connection for Paris on our transatlantic flight aboard a wide-bodied jet. We enjoy in-flight movies, dinner and breakfast aloft. This morning, we arrive in Paris and are greeted by our Unitours tour manager who will remain with us for the duration of our pilgrimage. We journey to Lisieux, where St. Therese, known as “The Little Flower,” lived. Born in 1873, her autobiography, The Story of a Soul, was published in 1898. At the age of 15, she joined the Carmelites at Lisieux. Canonized on May 17, 1925, her extraordinary love of God and service to humanity come alive as we visit the Cathedral of St. Peter where she worshipped with her family. We enjoy an included lunch together at a restaurant in Lisieux. After lunch, we visit Les Buissonnets, her family home, which includes the statue of the Virgin Mary, which smiled at St. Therese as a child, curing her of a serious illness. It also features a garden statue commemorating the moment Therese first shared her vocation with her father. We visit the small museum at the Carmel where Therese lived. This evening, we may have the opportunity to pray with the sisters in the Carmel Chapel where St. Therese prayed. The chapel is walking distance from our hotel. Dinner and overnight at our hotel in Lisieux. Today after breakfast, we visit the American Cemetery in Normandy and pay homage to the American and allied soldiers who paid the ultimate sacrifice. We stop to walk along the most famous Normandy beach, Omaha. The landing on Omaha Beach was the hardest fought and most costly of the D-Day landings, and the one that came closest to failure. We continue to Mont Saint-Michel, one of the most dramatic sites in Europe. Built on a stalwart island, we visit this wonderful sanctuary/abbey, which took nearly 500 years to build. One of France’s most recognizable landmarks, Mont Saint-Michel and its bay are on the UNESCO list of World Heritage Sites. We celebrate Mass and then enjoy free time for lunch, before our guided tour. Return to Lisieux for dinner and overnight. This morning we visit the Basilica of St. Therese where we pay homage to her extraordinary parents, Sts. Louis and Zelie Martin, who were both recently canonized. We celebrate Mass before we bid adieu to Lisieux and journey into the City of Lights, Paris. After free time for lunch at a reserved location, we visit Sacre Coeur, located at the summit of Montmartre, the highest point in Paris. We explore the Basilica complex including a garden for meditation. 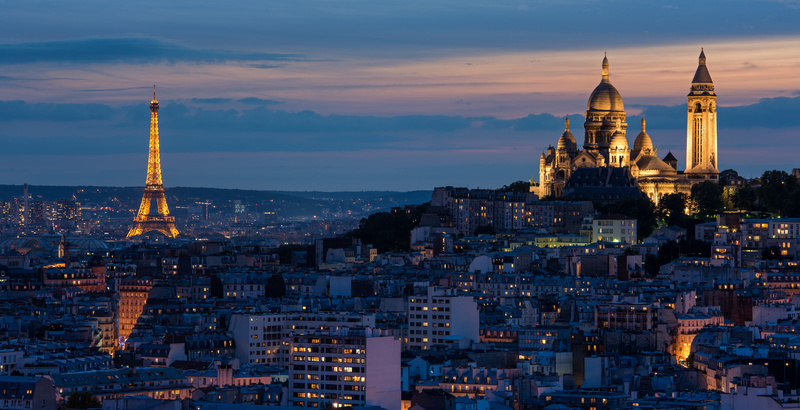 Some may choose to climb to the top of the dome to enjoy the spectacular panoramic view of Paris. We then walk over to Saint-Pierre de Montmartre church, founded by St. Denis, one of the patron saints of France. We continue with a driving tour of Paris, traveling down the Champs Élysées past the Arc de Triomphe, and of course, past the Eiffel Tower before boarding our boat for a ride on the Seine! After hotel check-in, we enjoy free time to wander the streets of Paris and soak up the atmosphere. Dinner and overnight at our hotel in Paris. After breakfast, this morning, we celebrate Mass at the chapel of Our Lady of the Miraculous Medal on the Rue de Bac, where Mary appeared to St. Catherine Labouré and gave her instructions to make the Miraculous Medal. The shrine contains the incorrupt body of St. Catherine. We will walk around the corner to the Shrine of St. Vincent de Paul, at the Church of St. Lazare. St. Vincent de Paul’s tomb is here. He was a shining example of love for the poor. We enjoy free time for lunch close to a wonderful market featuring many French foods and wines, ideal for gifts. This afternoon we visit the famous Notre Dame Cathedral, a high point of our pilgrimage, for a guided tour. Tonight, we gather early for dinner at our hotel in preparation for our special evening visit to the Louvre Museum, where we see the Mona Lisa and other impressive works of art. We’ll have another chance to enjoy Paris by night as we return to our hotel for another overnight in Paris. Today, following an early Mass at a church near our hotel, the balance of the day is ours for shopping and personal adventure. An optional excursion may be offered depending on the interests of the group. We are free to explore the culinary delights of Paris tonight as dinner is on our own. Today we depart Paris early and head to Chartres, a former pagan sanctuary which was evangelized in the fourth century and became a pilgrimage site in 876. In this year, Charles the Bald gave the town the tunic tradition says was worn by the Virgin Mary while giving birth to Jesus. The 13th century cathedral dominates this idyllic town, surrounded by wheat fields. The church building itself is literally a Bible in stone, with over 4,000 sculpted figures and 5,000 figures in the stained-glass windows, illustrating the Bible and lives of the saints. We enjoy an in-depth guided tour of Chartres and celebrate Mass. After Sunday Mass, we have free time for lunch on our own and exploring the town. We continue to Nevers for dinner/ overnight. This morning we visit the convent of St. Gildard, where Bernadette Soubirous of Lourdes spent the final 13 years of her life. We enjoy a guided tour of Nevers and also see the incorrupt body of Saint Bernadette, kept in a glass reliquary. We continue to Paray le Monial, known as the City of the Eucharist, and visit the site of the Shrine of the Sacred Heart of Jesus and Saint Margaret Mary Alacoque. Here we stop in the Chapel of the Visitation where we celebrate Mass. After free time for lunch, we journey to Ars, the village of the Holy Curé, and visit the house and shrine of St. John Vianney, the patron saint of parish priests. We have a guided tour of Ars and view the shrine of St. John Vianney. We also stop at the famous statue on the outskirts of the city. Dinner and overnight at our hotel in Ars. We depart from the Ars area after breakfast. We journey along the Rhone River to Lourdes. Upon arrival, we celebrate Mass in Lourdes and visit the grotto. In the evening, we join pilgrims from around the world for the Torchlight Marian Procession. Dinner and overnight at our hotel in Lourdes. This day is spent in devotion to Our Lady of Lourdes. We celebrate an early Mass, followed by an opportunity to experience the healing waters of the miraculous Lourdes spring. We continue with an orientation visit to the shrine and a walking tour of Lourdes, visiting Boly Mill, where St. Bernadette was born, the Cachot, formerly used as a jail, where she lived during the apparitions, and the parish church. Following free time for private devotions, we may join the afternoon Eucharistic Procession, and witness the Blessing of the Sick. Tonight, we celebrate our pilgrimage with a farewell dinner at a local restaurant. In the evening, we once again join the Rosary and candlelight procession. Overnight at our hotel in Lourdes. Early this morning our extraordinary pilgrimage concludes as we drive to Toulouse airport and board our flight back to the USA via Paris, arriving later today. Our memories of our spectacular Shrines of France – will stay with us forever.